The Lodge at Wolverton Heights in Canaan Valley, West Virginia...the place to stay! 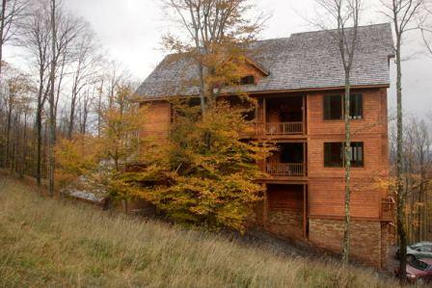 West Virginia's Premier Vacation Rental Home: A luxury villa in the woods. See calendar below to confirm availability for the desired dates. If the time is already booked please let us know as we have other properties that we can recommend. Thank you! Put your mouse on the area of the house you wish to view, then click on the circle and it will bring up the picture of that area. Also, click on the choices in the Panorama and Slide Show boxes at the top for views of Canaan Valley. When you think of Canaan Valley, West Virginia, you probably think of great skiing, but what is great skiing without accommodations to match the experience? The Lodge at Wolverton Heights is a brand new, luxurious vacation oasis, and we feel it is "the place to be" in Canaan Valley. Wolverton Heights is the exciting choice when making your vacation plans. This 10,500 square foot house has it all! Imagine how ideal this would be for an extended family, friends, or a business retreat? 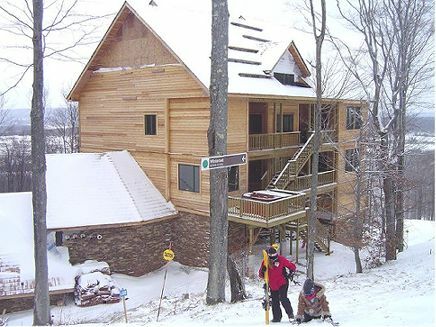 And if that wasn't enough, this house is located at the confluence of 4 ski trails: Upper Dew Drop, Winterset Spur, Lower Dew Drop (Terrain Park) and Upper Winterset Trails and is night skiing accessible. Dew Drop is a Terrain Park slope so guests will be able to watch the skiers doing their jumps from the living room. You may never even want to leave the house, but we hope you will because our location offers you proximity and convenience to all Canaan Valley attractions.